I know, I know, it’s been waaaaay to long since I wrote here. I am so grateful to my social media community for not getting too upset with me. I’m hoping I can just jump back in like one does with old friends. I want to give you a thumbnail update on all that I’ve been doing and thinking. As I look back over the months since my last post I realize what an interesting life I am blessed with. I want to say that I never cease reminding myself of the privileges that allow me to do what I do, privileges such as being white, being financially comfortable, being famous and being healthy. I take none of this for granted. I try to use what I have to help make things a little better for those less privileged. So, we finished Season 5 of “Grace & Frankie” and I feel it is a funny season that folks will relate to. The final episode is a humdinger!!! When it was over, I headed to Washington, DC, to lobby with the National Association of Women Farmworkers for overtime pay and the National Alliance of Domestic Workers for A Bill of Rights. This was on behalf of the #Times Up Movement. 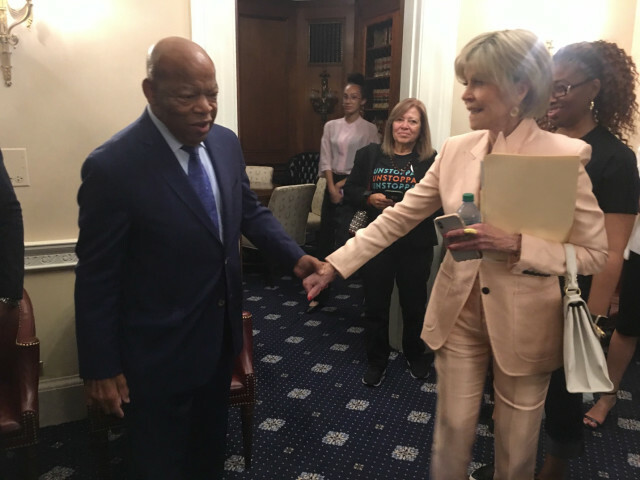 One special person I met with was the iconic Rep John Lewis. I first met him back in 1973 when I was in D.C. lobbying with Tom Hayden for an end to the Vietnam War. I’ve been at this a long time. No sooner did I get back than Lily and I hit the road, traveling to Michigan again in support of the One Fair Wage ballot initiative that would raise the minimum wage for everyone including tipped workers and allow them to keep their tips. ROC, Restaurant Opportunity Centers United, is the organization behind all the One Fair Wage efforts (we’re also fighting for this in New York and D.C.) In the 7 states that have this one fair wage, sexual harassment and poverty have been cut in half. The Republican legislature in Michigan under pressure from the powerful “other NRA” (National Restaurant Association) has tried to keep us off the ballot though yesterday we learned that the official committee that determines such things ruled that we made it, now as I am writing this, I heard that they are trying to repeal the One Fair Wage measure— kick us off the ballot for some rigged reason We’re prepared for more political shenanigans from the GOP but we’re prepared to fight. We know that folks in Michigan will want to vote themselves a raise and we’ll defend that. I’m planning to go back in October to rally voters. I know there are people who say celebrities shouldn’t get involved and they will attack our ballot measure saying that people outside Michigan are too involved. But look what we’re up against: the NRA is spending tens of millions of dollars to defeat us, as is the Republican Legislature. It never stops and there’s no reason that people who don’t live in Michigan shouldn’t help people who are suffering poverty level wages and terrible sexual harassment wherever that occurs. Too many people spend too much time worrying about whether the chicken they’re eating is free range but don’t give a thought about the people who are serving us our food! Speaking of Michigan, I attended the Traverse City Film Festival started 14 years ago by Michael Moore. 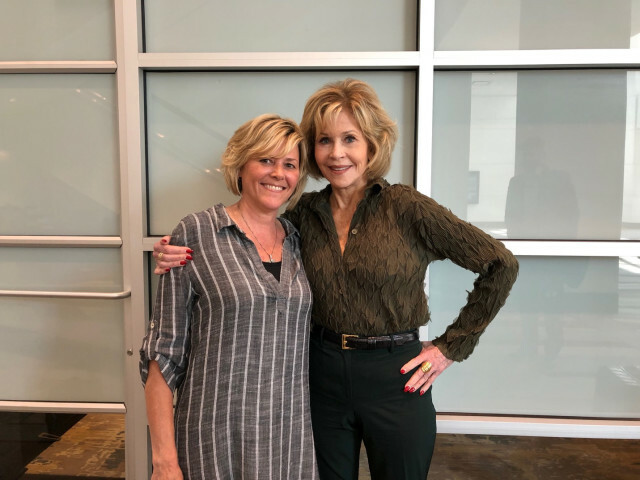 My HBO documentary, “Jane Fonda In Five Acts” was screened there and won the Best Doc prize. I had so much fun spending time with Michael both at the on-stage interview he did with me and during our private dinner. He does so much for Michigan and the festival has completely revitalized Traverse City which is now a lovely, thriving town on the banks of Lake Michigan. 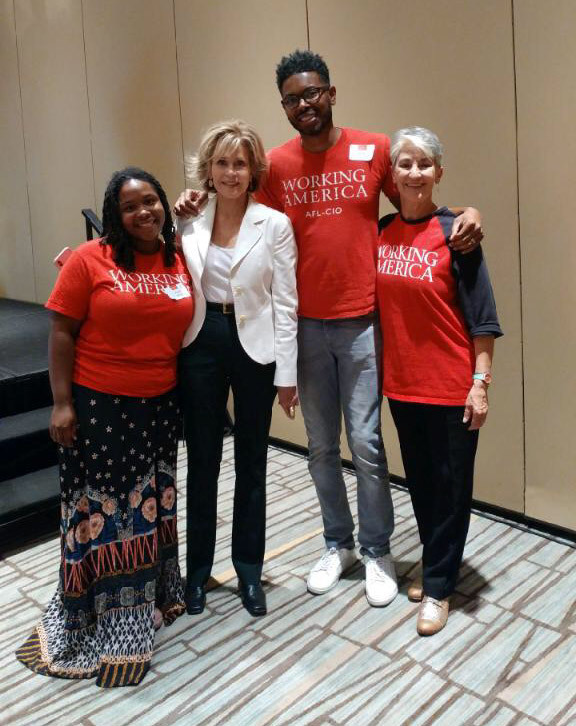 I was also in Chicago at a Leadership Conference held bi-annually for the staff of Working America, the community arm of the AFL/CIO. I had an hour-long meeting with 8 of the canvass leaders and was deeply moved and impressed by their stories. They are a diverse group—latinix, black, gay, White, Muslim, Jewish, Protestant. Mostly young. Most saw the canvassing jobs that were advertised on Craig’s List as a “just for a few months” thing. But then they had the experience of knocking on doors and changing people’s minds who started off not wanting to talk to them at all because of their race or because the person is a Trump supporter. They told me this was when they decided canvassing was a job they wanted to do forever. They knew they were making a difference and they all realize the importance of speaking directly with people who feel unseen and unheard. They listen to what people say is important to them and why. Health care, coverage of existing pre-conditions, schools, jobs, Social Security—these are top of list most often. Then the canvassers tell the person something they don’t know such as how the current administrations health care plan does away with pre-condition coverage or how his new tax plan benefits the already rich. Many people become members of Working America right then and there which means they will receive mailings relevant to their issues, and, if it’s during an election cycle, which candidate supports the things they think are important. The canvassing jobs are well paying, with benefits and year-round, not just during elections. This kind of on-the-ground, face-to-face work is essential. We used to do that. The Democratic Party used to do this. Complacency and a new focus on tech and other constituencies changed that and, in its place, the Koch Bros financed robust grassroots organizing that has resulted in the GOP gaining majorities in state legislatures and gubernatorial seats across the country. This is why I put my time, my energy and my money with organizations that do this ground work like ROC United (Restaurant Opportunities Centers) and Working America. While at the Working America conference, I met with Christine Campbell, President of the American Federation of Teachers in West Virginia who recently led the amazing teachers’ strike. She’s so smart and brave. I have also been out in communities in Los Angeles together with Black Lives Matter and White People 4 Black Lives, gathering signatures for a Reform L.A. Jails ballot initiative to stop the spending of $2.5 billion to build a mental health jail (total oxymoron, right?) and, instead, use the money to build proper mental health facilities and housing for the huge homeless in L.A. We mostly went to farmers markets on weekends to collect signatures and I can testify to how helpful it is to do this work when you have a hit TV series and a hit movie behind you!! People really wanted to see what I was doing and talk to me. We’ll be on the L.A. ballot in March. I went up to Sacramento, the capital of California, to lobby for ending forced arbitration. People who are not in a union are made to sign this agreement as a prerequisite for getting a job, along with non-disclosure agreements. What these do is prevent the worker from having their complaints brought before a court of law and being heard in the public sphere (complaints can range from sexual assault to wage theft, being fired for pregnancy, etc). This is how serial perpetrators and bad bosses can continue undetected. This too was part of the #TimesUp Movement. I was also lobbying with the National Association of Domestic Workers to demand overtime pay. This bill just passed the Senate. We’ll see of Gov Brown signs them into law. 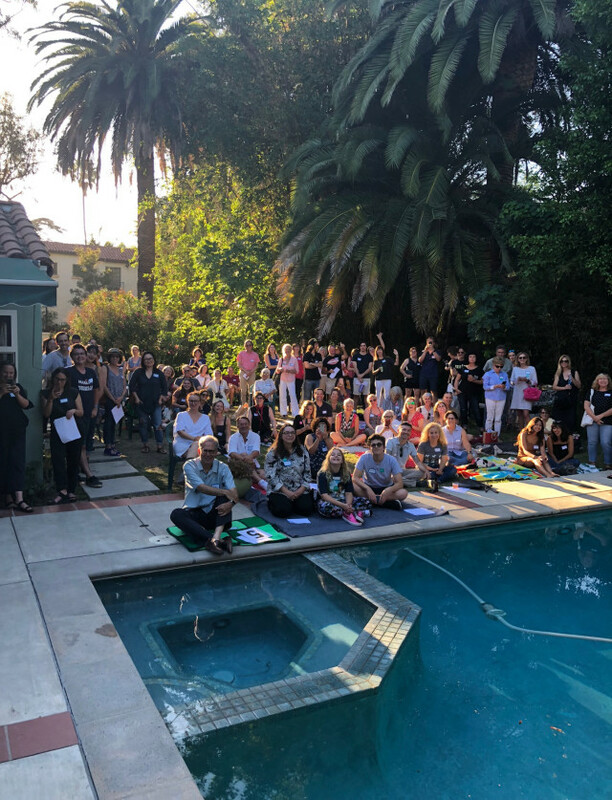 I spoke in a back yard in L. A. to people interested in canvassing. There are four congressional seats within two hours of Los Angeles where the Democratic candidates are outstanding. I am doing all I can in the weeks and months leading up to this midterm election Nov 6th. In all my 80 years, I don’t remember an election this consequential. We must stop the policies that are benefitting the rich and hurting the working class and poor. We must stop the pillaging of our lands and natural resources and the treating of our allies as if they were our enemies and our enemies as if they were on our side. We must try to elect people who want to change the way our economy works, the way our criminal justice system deliberately targets people of color and the poor and all the ways that we are being pitted against each other. And we must not allow someone to be appointed to the Supreme Court who would oppose bringing the president to justice if and when he is found guilty of crimes. If I wasn’t doing all this I don’t think I’d be able to sleep. There’s nothing like action and activism to salve the anxiety of being in the midst of an existential crisis. That and seeing all the amazing women who are running for office and winning and the young people who have taken it upon themselves to finally demand sensible gun legislation. It is they who will change the landscape of this country. Lady, you hear this all the time I’m sure, but I’m one 58 year old woman that just can’t fathom your stamina & determination. Thank you so much for being there on behalf of those less fortunate. Your are Right On. …p.s., oh, yr ref to Traverse City, Mich., I am right across Lake Michigan, on the other side, on the beautiful shoreline of Wisconsin. 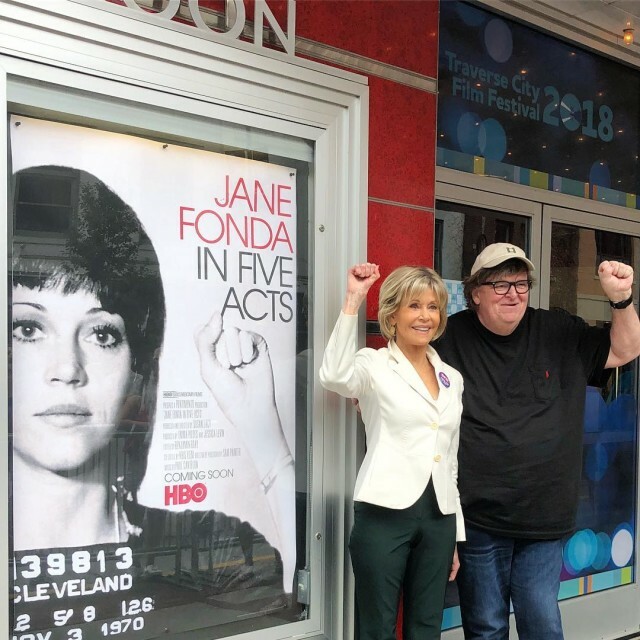 Much looking forward to seeing the Michael Moore documentary, “Jane Fonda In Five Acts” . . .
You wrote about communities in L.A. Well, I really love America, always have, but I decided recently to take the LA Metro instead of hiring a car – good for the environment and I wanted to support the Metro. Well, the train went through some areas where I was so shocked at the level of poverty…and in such a powerful, rich country!! I have been in other countries around the world, where I saw similar things, but I never expected it in America. It was heart-breaking. I can’t stop thinking about it, because I always assumed (being European) that we all, at least, in first world countries, are given the same chances to start off our lives with. I have now completely changed my opinion on that. I now know that is not true. Again, heart-breaking. I wanted to ask your opinion on something and that is how do you continue to discuss politics one-to-one when someone does not agree with you? I find these days that no-one wants to listen to the other side of the story anymore. We surround ourselves with like-minded people e.g. especially on social media and we all think that we are on the right side. But there are always two sides to a story. Whenever we come up against opposition now, I feel that very few people are prepared to listen to another point of view. I first noticed it with Brexit. Me and my friends constantly kept saying at parties ‘Don’t mention Brexit!’ for fear of literally no one speaking to each other. But that can’t be the way. We won’t survive if we are not open to others. People are walking out of discussions instead of trying to see another opinion. Why is this I wonder? It won’t end well, that’s all I can say. Anyway, I am currently in the midst of setting up my own professional theatre company here in Hamburg, which is taking my mind off many things. As Oscar Wilde said “I regard the theatre as the greatest of all art forms, the most immediate way in which a human being can share, with another, the sense of what it is to be a human being.” That is keeping me sane…along with Randy Rainbow. Dear Jane, hope your ok? Liking your post as it’s very interesting and informative. What a great person and activist you are! America should be proud. I cannot believe you are 80! What a beautiful woman you are! I have just finished watching the 4th season of Grace & Frankie! I love this show! You and Lily are amazing together and I love all the characters in the show. I thought I would die laughing when you two jumped on the table to get away from the rats! Such a down to earth and relatable show. I just turned 65 and wish I had a friend I could relate to the way you two do! My best friends all live in other states. I have thought recently of moving but don’t want to leave my son & grandson…the only remaining family I have. So for now I will wait. I admire you, your energetic life and your lifelong fight for the rights of those less privledged. Reading this blog my mind was reeling thinking of the pace of your life. Two years ago I became seriously ill and nearly died. Since that time my life has been very different from what it once was…I am limited on some levels. I am now disabled but not totally unable. Some days are difficult and I so desire to be who I once used to be. Thinking about you and your driven life I am inspired. Jane, I have followed your career since the Klute days. I attended one of your talks with my grandson (he was 13 at that time and loves you!) about 7 yrs ago in Frederick, MD. We enjoyed it so much but I truly regret not doing the meet & greet. I so hope you might visit this area again in hopes we all can meet. We love you Jane! Take great care of yourself and stay driven! As this crazy world needs you! To continue to fight for the rights of others and to continue as long as you can, to entertain us all! Our world is getting so depressing. I have now gained experience in two countries how some of these trends can wreck a society. The frustration, depression and desperation that I sense in people (especially back home in Hungary, but in the US too) is just really painful to watch for any human being with just a drop of empathy. And honestly, sometimes you just have to exclude all the crazy from your life not to be consumed by it. And in the remaining time, we just have to do what we can to put some sense into people even though sometimes I feel disheartened by how selfish people can be, denying basic rights’ of others. I feel angered and sad just writing about it. 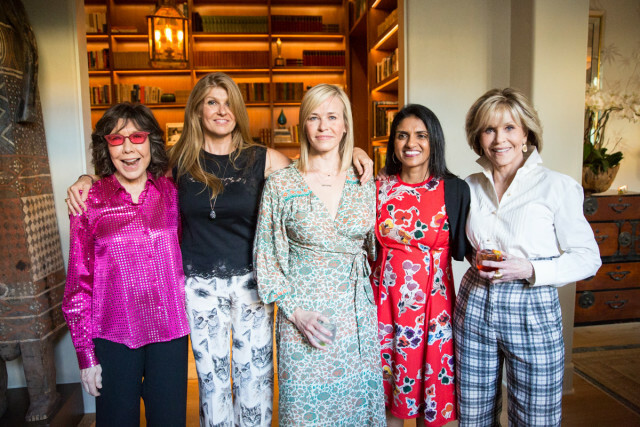 And I am so glad Book Club is coming out on dvd. That was such an uplifting, inspiring movie not only for me, but also for my parents and a lot of my friends. What a lovely movie, I am glad it was made, it’s so rare that a movie can speak to so many people so effortlessly. I read a review that said, if there is a good thing about 50 Shades of Grey, it is the fact that it inspired this movie. True that. Daniel,I absolutely cannot believe it was a year ago. OMG!!! Dear Ms. Fonda: I was wondering where you will be appearing next because I tried to get VIP tickets for your Milwaukee appearance at the Riverside Theater Nov. 3rd, but they told me that those tickets were already “sold out.” Please let us know where you will be appearing next so we may purchase our tickets much earlier. I’ve been a life long fan of your entire body of work and your activism. Thank you. I’m driving home from Detroit and I have about three hours left but i’m stuck in traffic at the moment so i figured while its so fresh in my mind now is a great time to say thank you for all that you do. Thanks for coming to Michigan, and for working so hard to make things better here and everywhere and for dedicating so much of your time to do all of it. As always, it was was so good to see you and to get a chance to chat and to hug you. Have a safe flight, I hope you find your way back to Michigan before too long. New subscriber here, I wanted to tell you that your show Grace and Frankie has been one of the most relatable show’s I’ve seen in years. At 31 I feel like I’m starting over with my two little ones and it hasn’t been easy to ward off feelings of depression. But your show is so amazingly human and it effortlessly shows the beautiful broken condition of being human. Thank you for this show, it makes me feel like I can forgive myself for all the mistakes I’ve made, and be okay with the fact that I am imperfect and that’s it’s okay to accept myself. Each character is a delight, and I’m just thankful there’s this one thing that helps me get through this chapter in my life. Found your blog after seeing the movie Book Club. I’ll be 51 in January. A few sneeky weeks away. Not so old I realize but, I’ve realized how age becomes an intricate part of your life after 49. After ending a 15 year relationship and leaving with my sanity alone I began bartending. It saved me so I appreciate the fight you speak of. Thank you. As a photographer I’m doing a personal project, portraits of women 50 and up. I’m beginning with a questionnaire things I’d like to know about how they feel about age and life. They will be environmental photos to show who they are at that moment. I liked what you said about age being scary from the outside but inside it feels pretty good. I know I feel that way. I’m hoping to see if others do as well. If you have any other questions to ask, I’d love to hear them. Thank you.